THE brother of tragic brain tumour mum Donna Miller has returned from a gruelling Arctic Trek to raise funds for charity. Beautiful Donna, wife of former Scotland international footballer Lee Miller, and mother to two of his children, died in April 2012 after battling a brain tumour for more than four years. 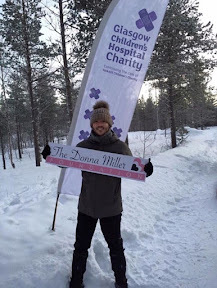 Her brother Sean Gilhoolie, 24, is just home after embarking on a three day trek into minus forty temperatures in the arctic circle to help Glasgow Children's Hospital Charity. Sean headed to Rovaniemi in Finland for the Trek. Having already helped to raise £100,000 in the four and a half years since she passed away, he said: "The Arctic Trek idea was put forward to me by Glasgow Children's Hospital Charity and what an experience I have had over the past week. Mentally and physically it was one of the hardest things I have ever done. I never want to see a hill, snow or a tents again. I have met some great people and there were high and low moments but I couldn't have felt prouder standing on the finish line with the Donna Miller foundation across my chest. I just want to thank everyone for their support. Sean added: "I was pushing myself and although my family were not too keen and my mum was worried sick I'm wasn't doing it half heartedly. I'm not a massive fitness person and my biggest worry was how I'd deal with a lack of sleep and walking all those hours every day. Donna wouldn't have wanted me to go as she was so protective but her kids were behind me and it was a great experience - and I didn't come back with just five toes." Sean only realised how serious his trek was after picking up some of the equipment he needs for it. 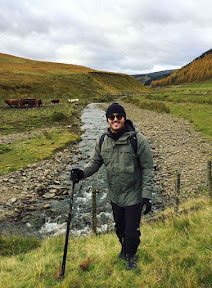 He said: "We were training on The West Highland Way and I had to buy a nine hundred pound sleeping bag for nighttime and a special jacket to walk in. Luckily my friends had given me a whole load of vouchers for my birthday so I got my equipment with that." Sean took a picture of Donna with him as well as a lucky charm from his mum. He said: "Donna's oldest child Lennon was so excited for me and made a personal donation. I don't think her youngest Bobby understood at first but I was showing him photos and he understood how cold it was going to be." "The kids even sent me a video message congratulating me on the trek."